Combining Larrivée's favourite tonewood with his preferred 12-fret neck, is it any surprise this is so good? Silver oak tones are full, with a crisp high-end. 12th fret join makes a big difference. Excellent quality and value for money. 12th fret join won't suit all players. Thanks to the 'heritage' classics in both the electric and acoustic guitar world, it's not only that we accept very few designs as players en masse, but those designs use even fewer wood types. In the acoustic world, outside of spruce, cedar, mahogany, rosewood, ebony and maple other woods are still relatively rare. Of course, there are numerous variations on these types, but more often than not, when a maker tries to introduce a 'new' wood into the recipe they face quite an uphill struggle to garner acceptance. "Our initial play test on this new Larrivée immediately makes you realise we might be missing something"
Yet our initial play test on this new Larrivée immediately makes you realise we might be missing something. Our silver oak OM-3 has a 12-fret neck-to-body joint and ebony headplate, fingerboard and bridge, while the back and sides have an eye-popping wow factor. The mottled figure is extremely unusual, and the pinkish colouration is a fine match for the dovetail jointed, one-piece mahogany neck. Its binding is a low-contrast maple, which gives the purfling more presence - a similar purfling is used around the back edges, too. There's a very light satin finish that's flawlessly applied. The entire build inside and out is really crisp and sharp - it's little surprise that Jean Larrivée and Bob Taylor have been friends since the 70s: in terms of their precise quality, the instruments they produce are hard to tell apart. But where the brands differ - though both are made in California - is in price versus specification. 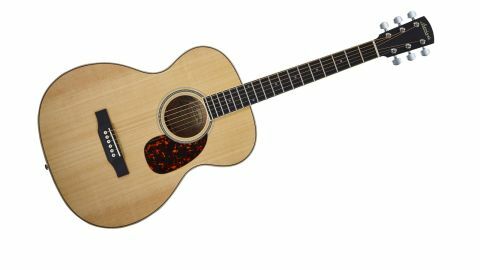 Taylor doesn't choose to make an all-solid wood guitar at this price and if that's important to you, then Larrivée should be very high on your must-try list. With Larrivée's experience and such a considered design, 'perfect' is the correct word to describe the fingerboard, neck shape and setup, not to mention the precise intonation. The Tusq nut and compensated saddle is perfectly cut; string height is roughly 2mm on the high E and 2.4mm on the low E (measured at the 12th fret). The neck has a mainstream C-meets-D profile (approximately 20mm deep at the 1st fret, 23mm at the 10th) with a little more shoulder perhaps than Taylor, and a subtly compound camber to the 'board that starts at 432mm to (17 inches) and flattens to 533mm (21 inches) by the top fret. The 44mm nut width allows a spacious 39.5mm string spread while the bride spacing, at 56mm, is equally airy. It's certainly fingerstyle friendly, but strummers and especially hybrid pickers shouldn't have any issues. The neck joins the body at the 12th fret and places its bridge lower down (on the same-size body) than a 14th fret join would - right in the centre of the lower bouts. Jean Larrivée is unequivocal about the effect that has on the guitar. "The silver oak certainly has a full voice, especially in the lower-frequency spectrum"
"I believe the 12-fret is a better guitar than a 14-fret. Number one, it's a sound thing. There are no ifs and buts about it. I know because I've made enough 12-frets and enough 14-frets to have an opinion. But when you put the bridge in the middle of the diaphragm [the top] you're getting the whole diaphragm moving. It's not me saying things: it's the truth. That's why classical guitars are 12-fret." The instrument is very light, and when played seated, switching from the 12- to a 14-fret, it almost feels top heavy, unbalanced. Of course, that's easy to adjust to, but it underpins that these are very far from lumpen, difficult guitar-shaped-objects. The silver oak certainly has a full voice, especially in the lower-frequency spectrum. The high end is spruce-crisp and breathy, and there's a papery texture to the sound, although we're still in new string territory. As ever, the more you play the more you hear, and while the silver oak's bold low end really works for bass lines, you sense it's more of a soloist's instrument. We're hardly lacking choice when it comes to medium OM/000-size guitars; for many players, it's the perfect balance between the more voluminous dreadnought and smaller parlours and the like, a style that suits pickers or strummers, performers or studio hogs. In short, you have a lot of choice for an all-solid acoustic like this, from quality and obviously more affordable Asian-made brands to the start-up models from USA giants - e.g. the recently introduced Martin 000RSGT, or Taylor's 312. However, this guitar is a superb pro-level tool, very well-priced and offering something a little different in terms of the woods and a 12-fret neck. It is a very special musical instrument that any discerning amateur or professional should be happy to add to their collection.